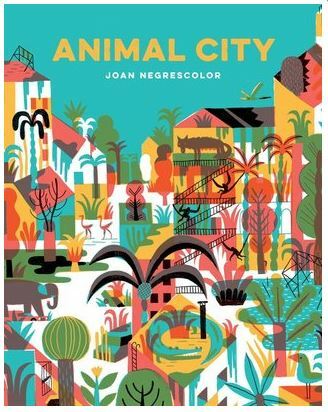 Animal City is an illustration-driven book with bold colors and geometric shapes on white pages. Nina visits her special place, an old city that has been taken back by the jungle and its animals, where she reads stories to the flamingos, monkeys, snakes, and jaguars—all living together peacefully. The concept of human cities slowly returning to the natural world is spooky and causes the reader to imagine what drove the humans from their home in the first place. The book delivers the impetus for a grander story despite its minimal text. Verdict: Animal City’s wonderful illustrations are accompanied by minimal text and may spark many writing prompts for young creative writers or storytellers. I recommend it for school and public libraries.